Sarah Cornwell is an author and screenwriter living in Los Angeles. 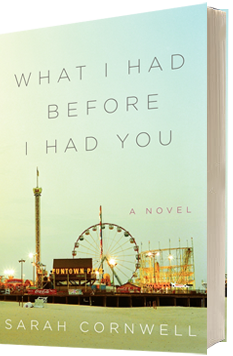 Her debut novel "What I Had Before I Had You" was published by HarperCollins in January 2014. She is the recipient of a Humanitas Award and the Gulf Coast prize for short fiction. "Captivating.... Depth of insight, dreamy prose, and an engrossing storyline mark this wonderful debut." "Cornwell’s first novel is an authentic and artful coming-of-age story that is uniquely multigenerational. This emotionally charged narrative is as memorable as it is compelling." "[A] bewitching first novel. . . . In chapters alternating between the puzzling, pressurized present and eerily predictive past, Cornwell weaves the novel’s double narrative with the deft touch of a magician and the sure hand of a confident writer to watch." "Sarah Cornwell has a brilliant eye for the telling detail, and a wonderfully original way of embodying family history. I was captivated by her memorable characters and the perfectly paced revelations of their surprising relationships." "Only a few writers can genuinely capture that stormy period between childhood and adulthood and Sarah Cornwell is one of them.... The result is an exhilarating, hurtling, unstoppable ride for the reader." "An incandescent debut by turns thrilling and meditative; part coming of age novel, part exploration of the fragility and complexity of love and family. Sarah Cornwell is a writer to be celebrated and watched." "Cornwell’s debut novel is equal parts page-turner and dreamy meditation on the nature of mental illness.... An important exploration of the deepest philosophical inquiries into the nature of existence, family, and love. I highly recommend." "Sarah Cornwell’s first novel is as unnerving and authoritative as Hilary Mantel’s Beyond Black. This is a beautifully written book, bold and wounding. Read it and you will never look at the Jersey Shore in quite the same way again." ***Like my facebook Author Page to stay in the loop--that is where I post news and thoughts more often!